The net that eventually drew us to opening an inn and tour company in Abruzzo, Italy was firmly cast in August 2007 during a trip to my wife Lisa’s incredibly beautiful ancestral village of San Sebastiano in southern L’Aquila. Lisa, her mother Anita Grassi, and our nephew Jordan Tarini reconnected with their family in the old country. They met dozens of relatives as the annual week-long party kicked off in the village. We discovered that after decades of lost contact Lisa’s family roots ran very deep in the picturesque Giovenco Valley. The excitement of meeting all these warm and welcoming people was overwhelming. On the second day of that trip, we really got into the swing of things as people we barely knew went out of their way to make us feel welcome and include us in the traditions. They invited us to parties, for drinks, to sing with them, to walk with them, and to be part of a larger group. This warmth has kept us going back to the village almost every year since then in August. We’ve come to be good friends with many of these people, and it’s doubtful we would be embarking on this adventure without them embracing us as they did. Next week, I'll get back to our path to opening Amazing Abruzzo Tours. But for this blog, I’m going to introduce you to some of these wonderful people. They hosted us in their hotel in Pescina for the first few trips. They've become great friends and advisors. It would be hard to image a more supportive pair. She's been a big booster since the day we met. A cousin and a man who knows how to get a flat tire fixed during the August vacation period. No small feat. Antonino's wife and daughter. They always make us feel welcome. Cinzia is our Italian/Germany cultural attache. Axel is her bello husband. A great couple who have turned into very close friends. We don't make any major decisions without consulting them. These guys always make sure we are included in all events and parties. A great bunch of people. Left to Right - Italia, Luigi, Maurizio II, Pina II, Valentina, Maurizio I, Pina I, Roberto, Carmen, Lisa, and me. These people have welcomed us to their circle with open arms. A great couple who really make us feel welcome. Rina also knows all the words to all the songs. Sergio is playing the guitar and Ezio is singing - that's him in the middle with his arm up. If there's a party, and there's always a party, Ezio is singing and Sergio ends up with the guitar because he knows all the chords. They are always there discussing the news of the day. If you need an opinion on anything, just ask them. 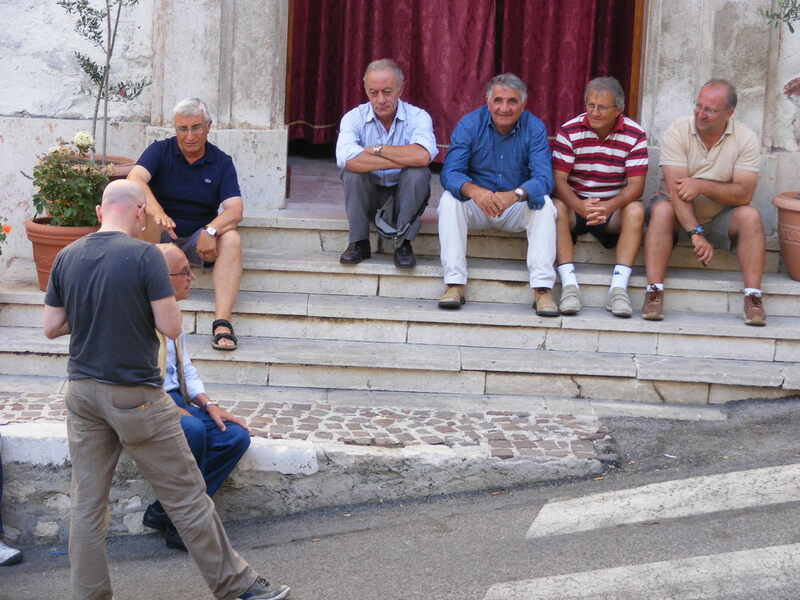 Every afternoon on the cafe terrace the scopa gang meets for a few hours of very loud cards. Great guys. Antonio leads a horse during the annual wood procession. He always makes sure we have everything we need. Journalist, bear watcher, music lover. Good friend. Sebastiano and Sebastiano. Great guys who always make sure we are well fed. They make some of the best wood oven pizza I've ever tasted. Things get hot for La Pupazza quite quickly. It never ends well for La Pupazza. There are many more people I should include here, but you get the point. 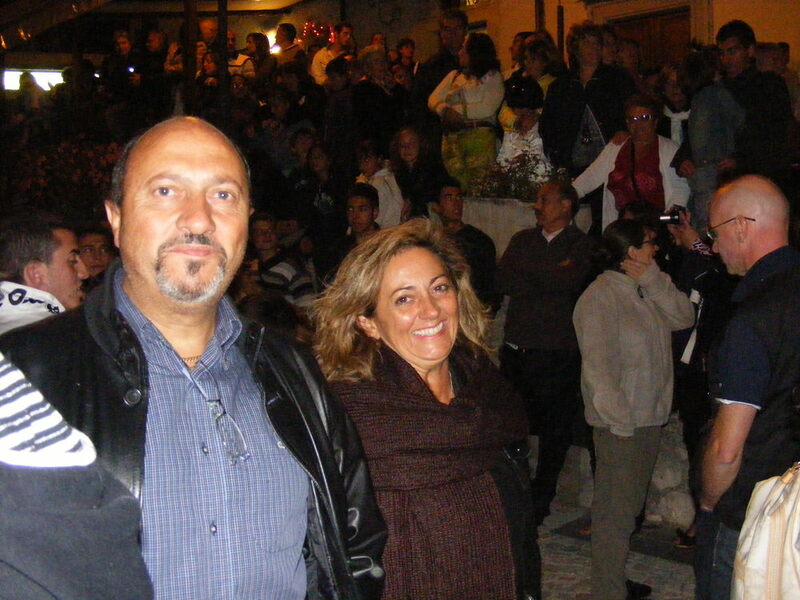 A big part of our decision to leave our comfortable jobs in Canada to open a tour company and inn in the rustic and beautiful Abruzzo region of Italy was the people of San Sebastiano. We truly have been welcomed with open arms into their community.